Our medical team is well trained in handling both routine (spay, neuter) surgeries all the way to performing complex surgeries other veterinarians cannot perform. 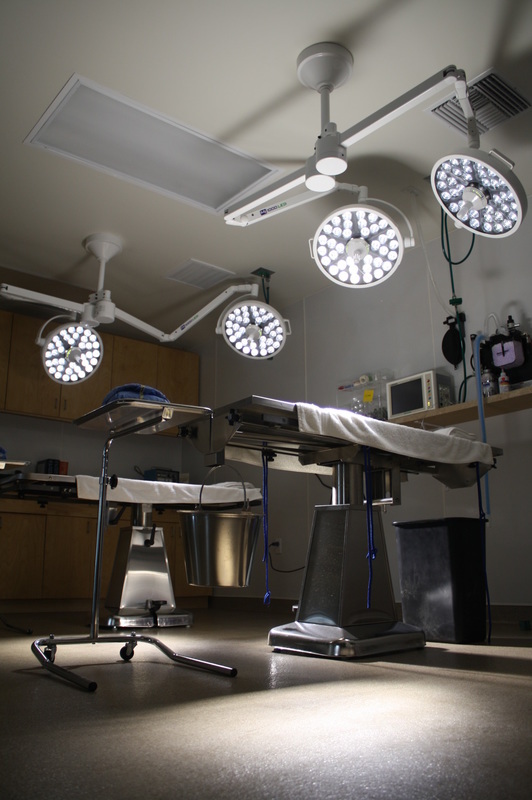 Dr. Ash is our lead surgeon and can perform hundreds of different surgeries. Prior to starting UVC, he was head of emergency medicine and surgery at a busy 24 hour hospital. Prior to that, Dr.Ash spent nearly 3 years in the specialty hospital setting where he helped provide emergency, internal medicine and specialty surgery services to local veterinarians and their patients. As a referral doctor, he was primarily involved in taking complex cases from other veterinarians. Dr. Ash has extensive training in internal medicine, emergency medicine and small animal surgery. Dogs and cats are brought to him specifically because of his high success rates with surgery. A 3 year old (very naughty!) mixed breed dog presented for repeated episodes of vomiting. The dog had been vomiting for over 24 hours and slowly becoming lethargic and dull in mentation. On physical examination, patient had a tender abdominal palpation so x-rays were recommended and performed. Radiographic (x-ray) evaluation of the abdomen revealed a persistent material stuck inside the stomach (not in the intestines, yet). Dr.Ash thus performed emergency stomach surgery and successfully retrieved the socks. He delicately closed the stomach and abdominal wall. Patient had a complete recovery (but was spanked pretty badly at home!). Follow up medical evaluations revealed no long term concerns and patient had a great prognosis and outcome. Problem: Dog went to find a girlfriend ♥ and accidently got hit by a car. A 5 year old male, intact (not neutered) terrier mix presented with sudden swelling in the left hind leg. With the client's permission, sedation and pain medications were given to the dog immediately following presentation to our hospital. This was performed so the pet was comfortable and would allow for a more thorough examination of the effected leg. Radiographic (X-ray) evaluation of the leg was performed while the pet was sleepy and much more comfortable. Those x-rays revealed a severely displaced fracture, meaning the broken pieces of the bone were very far away from each other. Surgery was recommended but because the pet was hit by a car, the medical team and owner elected to wait 24 hours to make sure the pet was stable and could withstand anesthesia. The pet was stabilized and montiroed closely for 24 hours and when the vital signs and bloodwork were normal, surgery was recommended and performed by Dr.Ash. Since the pet was an intact male dog likely looking for a female dog to mate with, the client requested that the dog be neutered at the same anesthesia period so this tragedy would never happen again. The pet had his broken leg fixed, was neutered to decrease the chance of running away again and microchipped so if he did get lost, he could be found and returned to the client. This pet was very fortunate and had a great outcome long term. Cystotomy - Surgery of the bladder, usually performed to remove bladder stones such as Calcium Oxalate or even large Struvite Stones. Nephrectomy - Surgical removal of the kidney due to cancer, kidney stones, or severe drug-resistant bacterial infections. Gastropexy - Emergency or routine prophylactic surgery in large dogs to treat and prevent life-threatening "bloat". Laser Surgery - Laser surgery provides our patients with faster recovery times, less pain during and after the procedure with optimal healing and often, less scar tissue in the incision bed. **The above is not intended to be an all-inclusive list of our services. If your pet is in need of something not listed here, please contact our office and our dedicated staff will help coordinate your needs in a detailed and prompt fashion. Does your pet need a special surgery? ​Don't worry, we can help you!